Sounders coach Brian Schmetzer held a struggling 3-9-3 team together long enough to make a second-half run. Now, after a turnaround that's the greatest in league history, they have a first-round playoff bye and shot at a third straight MLS Cup title game. 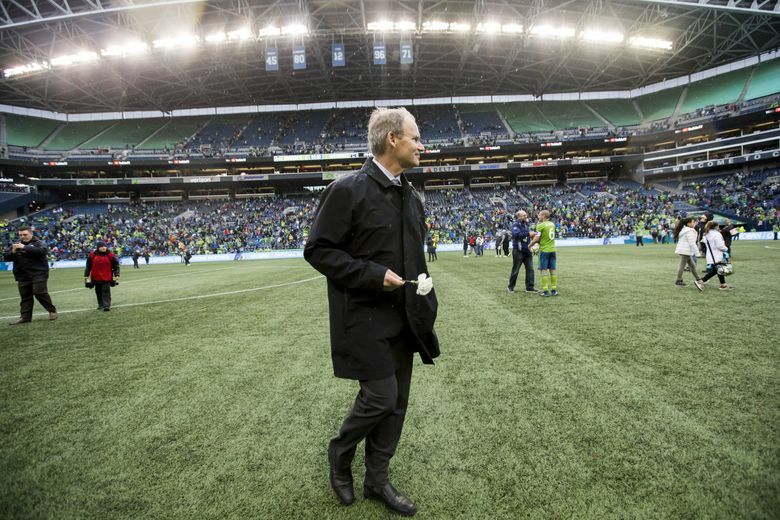 Seated in a Guadalajara hotel lounge last March, a downcast Brian Schmetzer divulged the bare and brutal truth of what lay ahead. His Sounders had already lost striker Jordan Morris for the season. And now, ahead of a decisive CONCACAF Champions League quarterfinal road match with Mexican powerhouse Chivas, head coach Schmetzer had only hours earlier learned midfielder Nicolas Lodeiro had a sprained midfoot that would keep him out a while. The news was devastating, as the Sounders had thrown considerable weight into their Champions League bid and now would have next to zero attacking ability against an opponent lethal at home. As well, the Sounders had already barely squeaked by diminutive Salvadoran squad Santa Tecla FC in the Champions League preliminaries and been blanked 1-0 at home by LAFC in their Major League Soccer opener. “We’ll do the best we can to make it through with what we have, it’s just that … ,’’ Schmetzer said, finishing with a shrug rather than completing a sentence that needed no further explaining. The ominous tone proved prescient not just the following night, a 3-0 defeat to Chivas that knocked the Sounders out of the Champions League tournament, but in another shutout days later at FC Dallas and throughout a 3-9-3 opening four months of the MLS season. That Schmetzer held the Sounders together long enough to complete the biggest turnaround in MLS history likely won’t win him Coach of the Year accolades but is testament to an even-keeled approach that never faltered in facing its biggest adversity yet. Some of what Schmetzer and players endured emotionally those initial four months, then an ensuing four in which they stunningly went 15-2-2, was evident Sunday in a postgame media address in which he choked back tears describing “a tough, tough season’’ of ups and downs. Moments earlier, with video cameras rolling, he’d addressed players in the locker room following their last-second 2-1 win over San Jose that clinched second place in the Western Conference. That Schmetzer alluded to “senior’’ and “younger’’ players in both cases was no accident. His biggest challenge this year involved convincing players young and old they still mattered. There were conditions rife for player mutiny, particularly early on, with the injury-depleted Sounders seeming certain to miss the playoffs and Schmetzer taking heat from all corners. But he never sold his players out, keeping in-house a powder keg of simmering tensions and pressure. There was the question of what to do with Magnus Wolff-Eikrem, the veteran Norwegian import brought over for big Targeted Allocation Money but whose sporadic offense and liabilities defensively were keeping him off the field. Also, Clint Dempsey, the fading superstar whose lost step over the prior season was badly exposed by a lack of offensive support around him. Lodeiro’s initial foot injury had been followed by a fractured toe he wanted more time to heal so he could make Uruguay’s World Cup roster — though the Sounders could have used him on the field sooner. Roman Torres had shown up to training camp in less than stellar shape, with a nagging hamstring problem that limited him as he prepared for a World Cup with Panama, while center back replacement Kim Kee-hee battled his own early calf injury. Finally, veteran left back newcomer Waylon Francis had struggled to fit within a Sounders system that differed from what he’d seen at Columbus. Second year left back Nouhou also wasn’t supplying the offensive spark that the departed Joevin Jones had in 2017. By May, according to team sources, Francis was left at home for a game at Portland after loudly protesting his lack of playing time. Then, in August, Nouhou was pulled at halftime in Minnesota, with coaches not happy with how he’d responded to in-game directives. At that point, the team had just signed left back Brad Smith to replace Nouhou as starter and bump Francis to No. 3 on the depth chart. But Schmetzer and the coaching staff worked feverishly to reassure an upset Nouhou, still only 21, he wasn’t being abandoned. And Francis that he still mattered and could play a role down the stretch. In hindsight, it was vital Schmetzer not “lose’’ either player mentally since Smith suffered a serious hamstring injury after only a few games. Nouhou has been the starting left back since with Francis his backup on a team that’s won 14 of 16. Likewise, the hands-off approach to Lodeiro’s World Cup aspirations ahead of rushing him back might have saved the season. The arrival of Peruvian striker Raul Ruidiaz in July provided the finishing touch missing from the attack but Lodeiro has been the offensive catalyst, supplying a team record 16 assists in 27 games and creating plays from all angles. Not everyone made it this far. Eikrem was released while Dempsey retired rather than stay with a team unlikely to play him much. Schmetzer thanked both Sunday for contributions, Eikrem for a huge assist in a win at Toronto and Dempsey “for being the greatest goal-scorer this country has ever known’’ and gracefully handling the pressures coming with that. Those who stayed, be they Nouhou, Francis, Harry Shipp, Will Bruin and even Torres, now on the bench behind Chad Marshall and Kim, have bought in to a system in which they know they can win a championship by accepting their roles. Schmetzer also gave shout-out postgame to assistant coaches that had his back during the darkest moments, providing positive reinforcement to players sometimes reluctant to hear it. Now, nearly eight months since Guadalajara, Schmetzer and his staff begin another title quest knowing they’ve already survived the worst.